As cool as this application is…which it is, Apple’s stock notifications just don’t cut it…it does not work for me. 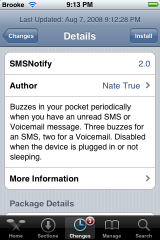 I tested both the SMS and the voicemail notify and neither worked. My iPhone was in sleep mode when I tested them and I left it sit for quite a while…I got nothing. Let me know in the comments if this app is working for you…it can be a lifesaver! Note: This is just a code app. Which means after you install it, there will not be an icon on your SpringBoard. 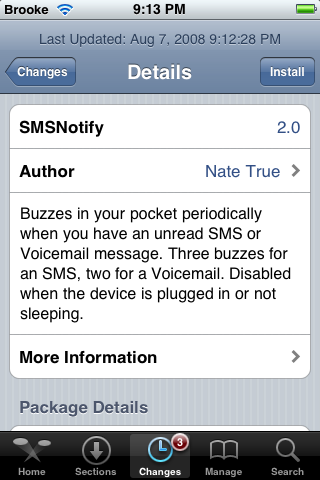 Update: My iPhone just vibrated for the missed SMS and voicemail. This happened when I brought my iPhone out of sleep mode. So, I’m not sure what the deal is with that! sometimes when you edit a .plist file, which is what SMSnotify is.. you need to restart your phone. try that if it doesn’t work right away! I’ve seen this app quite a lot on 1.1.4 and even 1.1.3 on Installer, but it never seemed to work properly. This does no effect on my phone either. But when I wake up my phone, it vibrate. I second the vote for Taskbar Notifier. i’m glad to see this. pending message notification has always been a sore spot with me in regards to the iPhone. Kate does the job well, so hopefully we’ll be seeing that soon too. amusingly, i tried using this program under 1.1.4 and never did get it to work. didn’t work for me till I came out of sleep mode. What’s the point of it then. It only works for me when I come out of sleep. I installed this on my freshly 2.1 phone, and it did not work for me either. If you edit the file, you see that the condition under which it will vibrate the phone is based on a call to sqlite3… That wasn’t on my phone. So it didn’t work. I’m on version 2.1 too and moved that sqlite3 file across that I found but still can’t get it working. Where did you get the version of sqlite3 from??? Pwnage 2.0.2 to be released tomorrow (Friday).